If the above list does not display correctly, please CLICK HERE to view our current openings for our Anne Arundel County and Charles County locations. You will be redirected to our career page on Indeed.com. 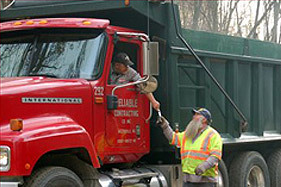 Reliable Contracting Co., Inc. is an Equal Opportunity Employer. Veterans and Women are welcome and are encouraged to apply. Employment applications are only available at our administrative offices. Please visit one of our locations below to complete an application. We look forward to meeting you! For more information call 410-987-0313 or email us at hr@reliablecontracting.com. The growth and progress of any organization like ours depends on its employees… people with initiative, creativity and enthusiasm working as a team in an atmosphere of respect and harmony. Reliable’s success is due in no small part to the talented, professional and loyal team that we have assembled. Our mission statement includes a line, “to provide for individual success”. We take this seriously and promote from within whenever possible. Reliable maintains a strong commitment to the welfare of its employees and strives to provide all employees with a benefits package that is cost effective and comprehensive in design. More than 40% of our employees have been with Reliable for 10 years or more, and many represent second- and third-generation employees from the same family. But new employees are needed also, to bring a fresh perspective and new ideas to our company. If you share our enthusiasm and think you have the potential to meet our high standards and help us maintain our leadership position, we invite you to inquire about open positions that match your qualifications. Contact either of our office locations. Reliable recognizes that our employees are our most important resource; without you, our success would not be possible. We believe that the investment we make to provide benefits to improve our employees’ quality of life, are the most important dollars we spend. FORMS: These common forms used by our Human Resource Dept. can be downloaded for your use. This coverage is offered by Reliable. For information, contact our Human Resource Dept. 410-987-0313 or hr@reliablecontracting.com. Mutual of Omaha Life Insurance. You are able to purchase additional coverage at group rates. Please contact our Human Resource Dept for more information. See Employee Handbook or contact our Human Resource department at 410-987-0313 or hr@reliablecontracting.com. The guys at Reliable are my ‘go to guys’ when there’s even the slightest question.